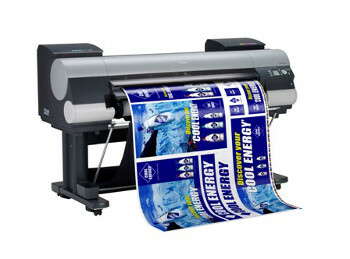 'Wide-Format Graphic Arts Printer Line of the Year'. Canon imagePROGRAF 8400SCanon has announced that it has scooped the Buyer's Laboratory LLC (BLI) award for '2014 Wide-Format Graphic Arts Printer Line of the Year' thanks to the overall strength of its imagePROGRAF series of printers. In addition, Canon's imagePROGRAF iPF6400S, iPF8400S and iPF765 MFP M40 printers won three prestigious BLI Winter 2014 'Pick' awards in the wide-format category. The BLI 'Wide-format Graphics Printer Line of the Year' accolade is awarded to vendors whose product lines are judged to be the best overall in their respective categories based on a rigorous two-month evaluation process. The criteria used to determine which products meet the standards set out in the wide-format category are reliability, image quality, ease of use, colour management, productivity and connectivity. Also taken into consideration is the breadth of the product line and its ability to produce quality products that cater to a broad range of customer needs. The BLI said that its testing of the imagePROGRAF iPF6400S and image PROGRAF iPF8400S printers - both of which were selected as BLI 'Picks' in their respective categories - showed exceptional colour consistency, with 'amazingly low' Delta E values of 0.92 and 0.79 in output on two non-Canon media types. Joe Tischner, wide-format analyst at BLI, said: "The comprehensiveness of Canon's offerings, satisfying the production/proofing print markets with the eight-colour models and the high-end graphics markets with the 12-colour models, across all the common size ranges, together with the outstanding lab performance of all the models tested, have justly earned Canon the 2014 Line of the Year award for its wide-format graphic arts printers. Canon's imagePROGRAF models go a long way in satisfying the needs of the customers by providing numerous capabilities and outstanding overall quality." Canon also confirmed that in this year's BLI Winter 2014 wide-format 'Pick' awards, which celebrate the products that give the best performances in BLI's extensive laboratory testing process; three of its machines were recognised. The imagePROGRAF iPF6400S printer was named the 'Outstanding 24" eight-colour wide-format graphic arts printer', while the imagePROGRAF iPF8400S printer won the award for 'Outstanding 44" eight-colour wide-format graphic arts printer'. Both models were praised by BLI for 'superb performances during BLI's demanding lab evaluation' with 'flawless reliability' and 'very good colour output without graininess, mottling or banding'. Furthermore, the Canon imagePROGRAF iPF765 MFP M40 printer was named the 'Outstanding Colour Wide-Format Technical MFP'. Yuichi Miyano, Director, Large Format Solutions, Canon Europe, said: "Canon's imagePROGRAF series of printers is known for high efficiency, reliability, colour consistency and productivity. It's an honour to be the recipient of these awards, and to be recognised for the series' ability to execute frequent, large-quantity requests that meet the highest standards."